and Noelia, Celeste and I can’t believe that the big trip to the US is nearly upon us. As some of you may know, I will be stepping down as director of Copey Learning Center (CLC) at the beginning of June, so Arthur (Scrapper) invited me to take this opportunity to share a reflection about my time working with this wonderful project- a project that could not have been successful without him, Dr. Church, and all of you (Friends of Copey) in your kindness and generosity towards this community. 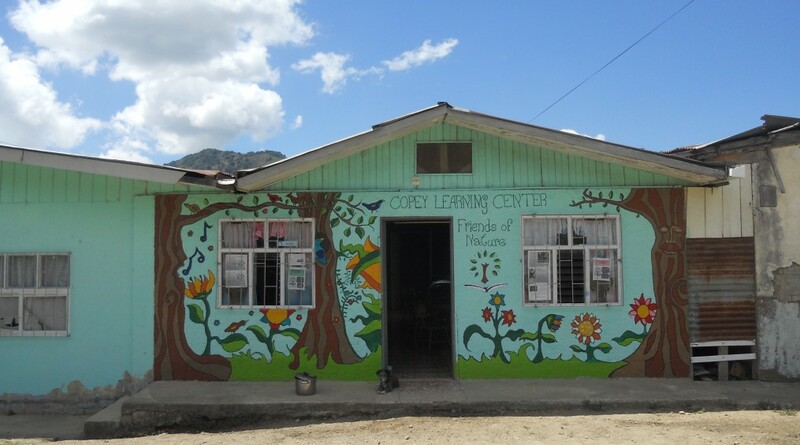 My experience with CLC started when I first arrived in Copey in 2010 as a Peace Corps Volunteer. Because one of my primary assignments was to work with the Learning Center, then barely six months old, one of the members of the board came to meet me in Santa Maria, the town at the bottom of the mountain. We put my suitcase in the back of the pickup truck, and drove up…and up…and up! When we finally arrived in Copey, I couldn’t believe my good fortune. Not only had I arrived in a breathtakingly beautiful place, but I was quickly welcomed by an incredible community with a clear vision for its children and its future. From late 2010 to 2012, I worked alongside the members of the board to keep the Center in volunteers, build our connections and resources, and continue to improve our institutional organization. During that time, I also taught some of the classes and put together a little children’s choir, getting to know my students and their families, taking part in community activities, and little by little becoming a part of their lives as they became a part of mine. Once I had finished my initial Peace Corps Service (27 months), I moved to the country’s capital, San Jose, to work but I returned to Copey nearly every weekend for the next two years to see my host family, my friends, my neighbors, and (last but certainly not least!) the man who would become my husband. When we got married, I moved back to Copey, and dove back into the Center, this time as the Executive Director. for students in need of scholarships as well as a network of people invested in the project’s future. We could never have imagined, that we would be able to receive two students from the US and bring two of our high school students abroad, but it’s happening. Hardworking parents who didn’t have the opportunity to become literate have the pride of watching their children become bilingual, and students who would otherwise have limited access to artistic, cultural, and environmental education are able to participate in enriching experiences on a daily basis while becoming proficient in another language. with these students, and the time has passed in a blink of an eye- finger painting and singing songs with first graders who are now sixth graders headed off to high school. Making up silly stories about cookie thieves with fifth and sixth graders who are now in university. Donning our homemade Christmas capes and excitedly heading up the mountain to sing as guests for a neighboring school during a holiday gathering. My high school students throwing me a surprise birthday party. My adult students reminiscing about local history in English… I have come and gone for CLC, but my time with all of these students has been so precious, and I am so thankful to everyone who has made it possible for us to have had these experiences together. Some of the Center’s students will use English in the future to study medicine. Some will use it to travel, to talk to their grandchildren, to find well-paying jobs. Some will continue to study for the joy of learning another language, to understand music and movies… Others may find that their lives lead in another direction, but I have no doubt that even the students for whom English doesn’t end up playing a role in their daily lives will look back on their time in the Center- connecting with others, mindfully developing values and character, and engaging in a variety of experiences- as time extraordinarily well and happily spent. Thank you again, so very much, for the opportunity to be a part of this project and for your continued support of Copey Learning Center. God bless you and your families. She has set the bar high! Yes, she has done that and she assures me her replacement who is already identified will measure up to the task. Thank you.